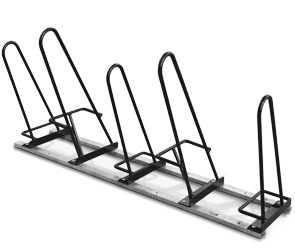 The Shark™ Up Bike Parking rack is designed for high density bike parking. It is economical, practical, compact, and stylish. The shark fin design brings a playful element, making it the perfect bike parking rack to place outside or near aquariums, beaches or pools. The innovative rack features front wheel stops for positive parking, a 3/4" solid rod for U Locks, 16" clearance between bikes, tamper resistant construction, and easy installation. The Shark™ Up Bike Parking Rack is available in in-ground and surface mount or with a rail mount. Choose a galvanized finish for a muted gray color or select any of the powder-coated color options shown below for a glossy look. 2" x 2" and 2" x 3" Angle.